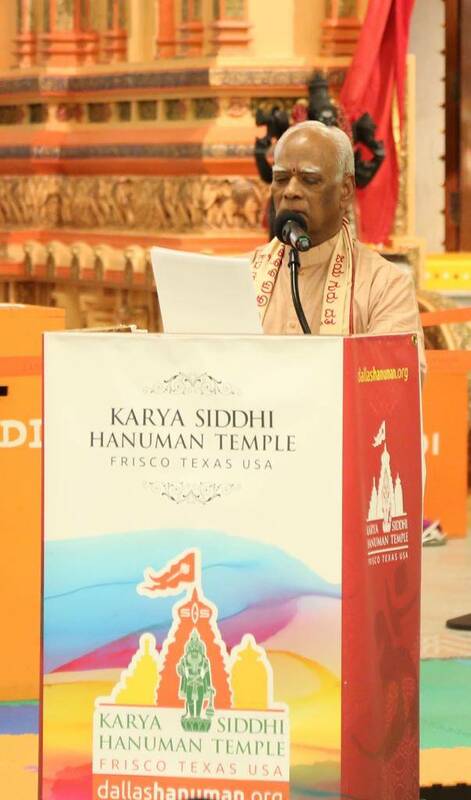 On behalf of Karya Siddhi Hanuman Temple and Datta Yoga Center, it is a rare, unique and special privilege to welcome Sri Datta Vijayananda Teertha Swamiji (whom we call fondly Sri Bala Swamiji), the Junior pontiff of Avadhuta Datta Peetham to this new, majestic, magnificent Temple. This is the Temple that was conceived, planned, guided, supported, and inaugurated by Sri Ganapathy Sachchidananda Swamiji. As many of us are aware that Sri Bala Swamiji has given saptahas on almost all the Gods and Goddesses, lectured on Vedas and Upanishad, Ramayana, Bhagavad Gita, spiritual matters and other scriptures. What was the reason He has taken so much time and energy to deliver these discourses? Sri Bala Swamiji intends to two things: 1) transmit the knowledge that would enable the devotees to be equipped with pride and prestige, and 2) also to appreciate, absorb and digest the qualities of each of these deities. Sri Bala Swamiji not only wants to narrate the story and make it relevant to the modern society, but he also enumerates all the uniqueness of the personalities of these deities for all of us to appreciate, acquire, absorb and digest them to make them part of our own personality. While talking about Lord Krishna, being a purnavatara, attributes such as his compassion, patience, wise counsel, forgiveness, justice, friendship, respect for the elderly, impartiality, detachment, bestower of wealth, dharma, honesty, truthfulness, and others are highlighted. Similarly, the characteristics of Lord Hanuman such as perseverance, selfless service, knowledge, strength, pragmatism, loyalty, humility, obedience, self- discipline, trustworthy, intelligence, and brave. Swami Vivekananda described Lord Rama “as the embodiment of truth, of morality, the ideal son, the ideal husband, and above all ideal king.” Sri Bala Swamiji described him as maryadapurusha, never spoke lies, honest, never boasted about his strength or qualities, never missed the comforts during his 13 years of forest dwelling, never disobeyed his parents and so on. Bhishma, Durga Mata, Saraswati, Lakshmi, Ganapathy, Subramanya, and other deities will inspire the devotees to take them as role models to follow. In fact, Lord Krishna says, “By performing their prescribed duties, King Janaka and others attained perfection. You should also perform your work to set an example for the good of the world. Whatever actions great persons perform, common people follow. Whatever standards they set, all the world pursues.” (Bhagavad Gita: 20-21). These traits and personality characters are described to serve as role models for all of us imbibe and make them part of our personalities. When he lacks it, a man is a brute. A devotee should heed the essence of Sri Bala Swamiji’s discourses and receive the blessings. Hence, we should not consider their discourses as mere words, they are loaded with so much power that would churn our hearts to change forever. Let us turn to humans from being brute with adequate knowledge. Sri Bala Swamiji has been talking extensively over the years about the greatness of dharma and truth, why we should protect it and what is our utmost duty to protect dharma for the welfare of the cosmos. Dharma is unique to Sanatana Dharma. No trace of secularism, exclusion, deception, terrorism, and elimination of others is included in the concept of Dharma. Sri Bala Swamiji is exhorting all of us to follow, practice, promote and share the concept dharma. It is dharma that upholds supports, sustains the people, nature, and in fact the entire cosmos. Dharma means righteous behavior based on truth and capable of bringing good to the whole creation. It includes individual duties, rights, laws, conduct, virtues and ‘‘right way of living’’ Every element in the universe has the obligation to perform their dharma/ duty. Sun performs its duty. Wind performs its duty. Similarly, it is our obligation to do our dharma to sustain humanity. He also mentioned about 10 essential rules for the observance of dharma: Patience (dhriti), forgiveness (kshama), piety or self-control (dama), honesty (asteya), sanctity (shauch), control of senses (indriya-nigrah), reason (Dhi), knowledge or learning (vidya), truthfulness (Satya) and absence of anger (krodha). "Yato Dharmaha Tato Jayah" - Where Dharma exists victory is guaranteed. Dharma teaches us to follow the principle of Vasudhaiva Kutumbakam, that all living beings in the universe comprise one family, and as such all beings are spiritually equal and should be respected as members within that family of the Supreme. It is most difficult to define Dharma. Dharma has been explained to be that which helps the upliftment of living beings. Therefore, that which ensures the welfare of living beings is surely Dharma. The learned rishis have declared that which sustains is Dharma. Those who indulge in adharma attain immediate success and secure fulfillment of their desires. They overpower their opponents. But ultimately their ruin down to the roots is certain. 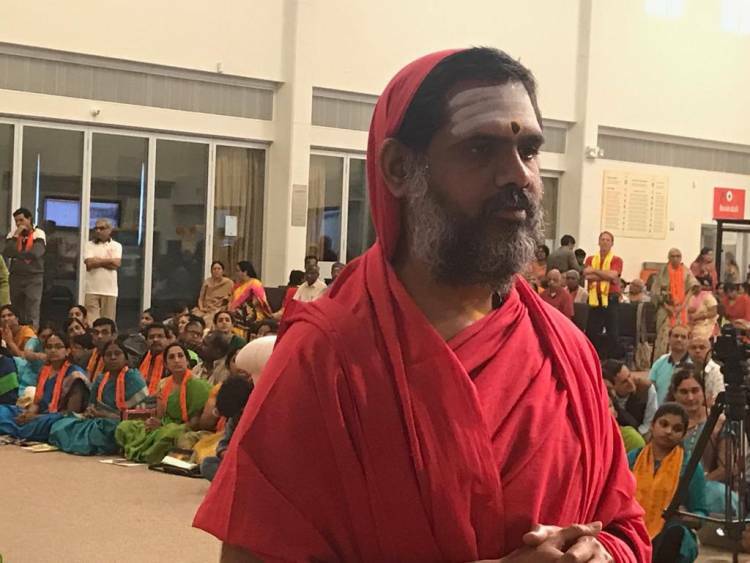 Recently, answering to a question about consequences of tolerances on the survival of Hinduism, Sri Bala Swamiji said that: “Having tolerance is always a boon. It is never a curse. It may appear as if it creates some unfavorable consequences. But it is not so. There is no need for us to change our stand.” But, He was equally emphatic about protecting our culture from the non-tolerance. Our house should not be allowed to be blown away. We have invited other faiths, honored them as our guests and even built their houses of worships. He said, “we should not get evicted from our own homes and end up in the streets. That is what has happened to us. That is what Swamiji says. Relinquishing your own Dharma in the name of tolerance is not Dharma. It is our Dharma which has taught us to be tolerance. By giving that up, you are going against your own Dharma. You are forgetting your values and those others are making you forget them. That is not correct. You must not reject your own Dharma and your family. That is very wrong. We cannot forever be only like Vasishta (peaceful). The Vishwamitra (aggression) in us also should sometimes raise his head. Only then we can survive in this society. Parasurama went around the earth 21 times and killed many kings. It is wrong to believe that he killed kings who were innocent. He killed only those who became ruthless out of pride. That is why Dasaratha escaped death. Parasurama later told Dasaratha, “You are following a righteous path. You begged forgiveness for your wrongs. That is why I have spared you.” Parasurama allowed many good kings to live. His purpose was not to destroy the entire race of ruling dynasties. It was to put an end to unrighteous warriors and to establish kings who followed Dharma. This we must understand. We do not have the vision to preach. We do not understand that our Dharma and its philosophy never advocated NOT TO PREACH. We have to understand its depth. We just visit the temples, do Namaskaram, break a coconut, when our wishes are fulfilled and get out. I am invited to different discussion groups and their motive is to see if I make negative comments about their religious beliefs. I always advocate living in harmony with other religious groups. But today, I am going to loudly and clearly say without hesitation that each one of us has the responsibility to protect Hindu Dharma. If we do not teach our religion to our children and others, Bharath Desham will sink. It will falter if we do not protect it. We are interested in receiving the blessings. We go to the Temples and pray to get the wishes fulfilled. But, we never do anything to protect our religion. We have become somewhat selfish. 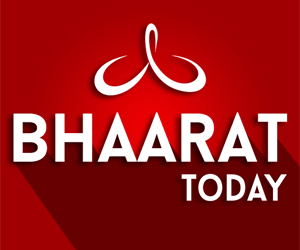 Bharath always has represented and distinguished herself as a country whose religion guides our life and shows a direction for our conduct. Guru Sampradaya or Parampara or tradition is the foundation of our religion thru which we teach how to interact with others based on right and wrong conduct and other scientific knowledge. We all need to march in the chariot of Vedas with Shastras as our weapons. Each one of us has to ask ourselves how and what can we do to protect our Dharma/ religion. Do not give an excuse by saying that I do not know any Sanskrit, how can I propagate. You can do your dharma with whatever knowledge you have in whatever language you can speak. As Datta devotees, we should not be afraid even if the sky falls down. Sri Ganapathy Sachchidananda Swamiji himself talked about the deception of the Christian religion and how to counter this menace. Talking in Eluru on February 17, 2014, He said that the people who resort to conversions here are extremely selfish and mean-minded. Like animals, people marry and keep having children. They are manipulating our intelligence and our strength to serve their own ends. They have robbed us. Now they have introduced chanting Namaha and puja in their religions. Is this in the Bible? Now they say, Mary Mataya namaha. Yes, I agree, Christ is an Avadhuta, but only 2000 years ago. Do you even know our ancient history? You must recognize the greatness of our history. If we help our needy and destitute, and if we help our own community, those who are trying to convert to other religions will not gain an upper hand… Please preserve and protect our dharma. Teach your children. We will become a minority if we do not take action. Then we will have to fight for reservations for seats in educational institutions and for jobs. We can worship our own God. God is one. Why should we go to another God to offer worship? Some only say I offer worship to Sadguru. It is okay to respect others and to offer them hospitality. But do not destroy yourselves in the process. Thus, Sri Ganapathy Sachchidananda Swamiji and Sri Bala Swamiji publicly and openly challenging all Hindus to take full responsibility of supporting, sustaining, promoting, propagating and protecting the Hindu universal values that are eternal, irrespective of time and place, so that the whole human race will live in peace and harmony. Ahimsa is the basis for all human existence. Any form of violence in the name of religion is the root cause of terror, torment, atrocities, cruelty, destruction, brutality, and massacres. Hindus and Hindu Institutions have a special obligation to protect their religion from being attacked. Any dereliction of duty on the part of these Institutions will result in untold misery. Some reflection of their responsibility will avoid the catastrophe that may be inflicted on Hindus by other religions whose sole mission is to convert with whatever methods that are available to them. Sri Bala Swamiji is saying that with the blessings and grace of a Sadguru, a disciple should be able to shoulder the responsibility of upholding the dharma, should become a warrior to protect dharma for the lokakalyana and should champion the cause of protecting Bharat from being uprooted by other faiths. We should not allow the history of eight centuries repeated in front of our eyes. Sri Swamiji’s WORD is very powerful, is charged with energy, and filled with unlimited power. It never fails. Any word that comes from Swamiji’s lips becomes a reality. Ver rarely these words come randomly. They are divine words that cannot go wrong. 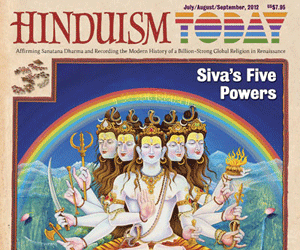 Swami Sivabala Yogi says, “How can the word of the divine Guru go unfulfilled. It is immaterial whether Swamiji in this form or that form. It is his all-pervasive and omnipotent tapas shakti, which acts and it is not confined to any particular body. Swamiji still lives in a subtle body.” (Guruprasad, Laghu Guru Upanishad). The concept of Guru is widespread in the scriptures of Buddhism, Sikhism, Jainism, Mahavir, and other Asian religions. The WORD of Guru has taken a central position in the Holy book of Sikhs, Adi Granth. Word of Guru is considered the cure for all cravings, underpinning of all existence, supposed to tame the wandering mind, stop the cycle of life and death, and finds meaning in life. [Only] knowledge imparted from the guru's mouth is productive [of liberation]; otherwise it is fruitless, weak, and the cause of much affliction. He who makes an effort to please the guru [through his dedication to self-discipline and service] receives the [secret] knowledge. In due course, he will also obtain the fruit of that knowledge. The guru undoubtedly is a father, the guru is a mother, the guru is a deity (deva). Therefore, one should follow him in all one's actions, thoughts, and speech. By the guru's grace one obtains everything auspicious. Hence one should always follow one's guru, or else there will be no benefit. The Guru’s word never fails. The spirits will chew up all those who go the wrong way. In youth, you fail to know. In pride, you fail to see. You can’t say when – now or tomorrow. You will clearly hear the sounds of his horse’s hoofs. Don’t say I did not tell you. Our both Swamijis told us. We can’t say they did not tell us. With their grace, march forward. Preserve our dharma. Protect our dharma. Fulfill your dharma. With this, let us all welcome Sri Datta Vijayananda Teertha Swamiji to Karya Siddhi Hanuman Temple with a round of applause.